According to an article in modernmetals.com this week, Domestic steel producers are finding it “troubling” that the industry’s highest average output so far this year has used only 77 percent of capacity but foreign-made product is capturing 25 percent and more of U.S. market share. 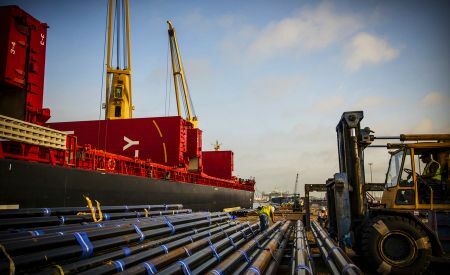 “Finished steel imports were up 17 percent, capturing 25 percent of the market during first quarter,” ArcelorMittal USA president and CEO Mike Rippey said during a May 5 press briefing held at the American Iron and Steel Institute’s annual meeting. AISI and its members have revised the import market share forecast for 2014 upward, based on what’s arrived through April. Based on the Commerce Department’s most recent Steel Import Monitoring and Analysis (SIMA) data, the AISI reported steel import permit applications for April total 3,682,000 net tons, up 14 percent from March final imports. For the first four months of 2014 (including April SIMA and March final), total steel imports reached 13.4 million net tons, up 29 percent from the same 2013 period. The estimated finished steel import market share in April was 28 percent and is 26% year to date, according to AISI. Rippey estimated the U.S. would consume 112 million tons this year, up 6 percent from last year, but import tons are now expected to climb 13 percent, 10 points above the original growth estimate of 3 percent. “And, U.S. exports will decline more than originally anticipated,” he noted. U.S. producers are among the lowest cost steel manufacturers in the world, enjoying clear advantages. “But the disregard of global free trade agreements as practiced by some foreign companies makes competition difficult,” he concluded.